[Updated with video] Earlier today [Jan 20] the Minister of National Security Michael Dunkley provided an update on the Gang Resistance Education And Training Initiative [GREAT], which is joint initiative involving the Ministry of National Security, the Ministry of Education & Economic Development and the Bermuda Police Service. Victor Scott Primary School P5 students became the first group to receive the GREAT Programme last Monday, and GREAT also being delivered at Somerset Primary and West End Primary Schools and is due to start at the Elliot Primary school later this week. “This is another tool in the fight against the increase in violent crime in Bermuda. We are determined to win back our communities by promoting alternatives to the gang lifestyle and its illegal activities. “G.R.E.A.T. is an effective gang and violence prevention program built around a classroom experience led by law enforcement officers,” said Minister Dunkley. 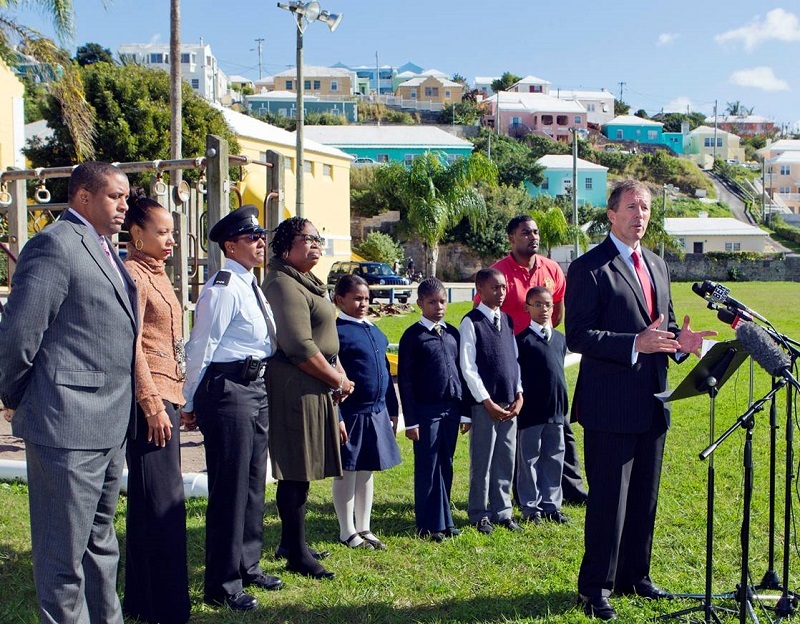 The Minister continued, “Bermuda’s gang issue is by no means resolved and it is the responsibility of law enforcement and governments to use every available opportunity to combine strong enforcement with clear alternatives to the gang lifestyle. Good Morning and thank you for coming. I am pleased to provide you with an update on the Gang Resistance Education and Training initiative or G.R.E.A.T. This is another tool in the fight against the increase in violent crime in Bermuda. We are determined to win back our communities by promoting alternatives to the gang lifestyle and its illegal activities. G.R.E.A.T. is an effective gang and violence prevention program built around a classroom experience led by law enforcement officers. The Program is intended as an early intervention against delinquency, youth violence, and gang membership for children in the years immediately before the prime ages for introduction into gangs and anti-social behaviour. Bermuda’s gang issue is by no means resolved and it is the responsibility of law enforcement and governments to use every available opportunity to combine strong enforcement with clear alternatives to the gang lifestyle. This Government has provided the Police with the resources to effect the strong presence in the community and likewise has implemented the Team Street Safe gang mediation programme to work with those caught-up in the dead-end path of gang life. I am extremely grateful to the United States Consul General Settje for all that the US Consulate Office has done to assist Bermuda as we research and implement best practice programmes and services with the sole aim of addressing the problems of anti-social behaviour and gang-related violence in Bermuda. 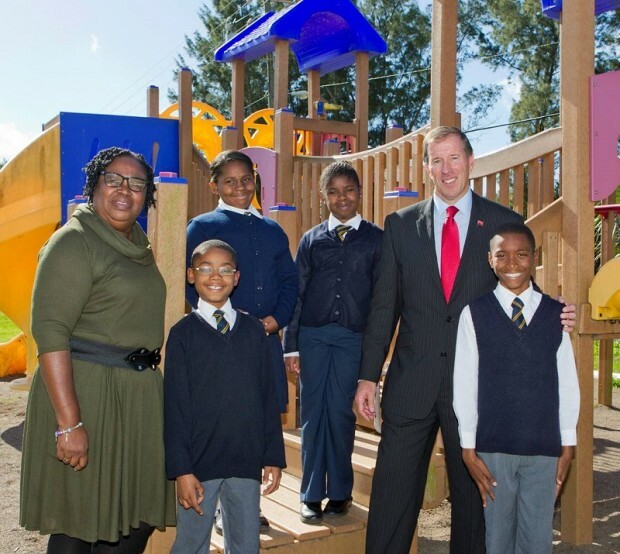 The US Consulate assisted us in contacting Mr. Ron Doyle at the Institute for Intergovernmental Research via the US State Department to discuss the re-implementation of this programme into Bermuda’s schools. As some of you may be aware, Bermuda previously participated in the program when the Bureau of Alcohol, Tobacco, and Firearms (ATF) managed it. It is now under the Office of Juvenile Justice and Delinquency Prevention (OJJDP). G.R.E.A.T. requires sworn law enforcement, corrections or probation personnel to instruct its curriculum. The intent is to build bridges between children and criminal justice personnel, and to leverage the knowledge and experience of these professionals in dealing with the consequences of violence, delinquency, and gang involvement, which also gives them greater credibility on this topic in the eyes of the students. The CAT officers were sent to G.R.E.A.T. Officer Training and G.R.E.A.T. Families Training sessions in Brockton, MA from August 5-16, 2013 as this provided an opportunity for our officers to receive the two courses consecutively. In an effort to meet our commitment to re-introduce the programme, the Ministry of National Security, the Ministry of Education, and the Ministry of Community, Culture and Sports each sponsored an officer in an effort to share costs for this important initiative. The training is a comprehensive course that focuses on the structure and content of the G.R.E.A.T. curriculum and provides knowledge of current gang trends, while building the skills necessary to teach in a classroom setting. I am pleased to confirm that each officer has been certified to teach the middle school curriculum, elementary curriculum, and summer program. The families training prepares our officers to plan, organize, and conduct the G.R.E.A.T families program in our communities. Each is certified to train their own co-facilitation teams which can include teachers, youth counselors, members of the faith community, parents, or other qualified adults who are committed to working with families. We are very proud of each of our officers and what they have achieved with their new certifications! Today, we highlight the Victor Scott Primary School, where the P5 students became the first group to receive the G.R.E.A.T Programme last Monday. G.R.E.A.T is also being delivered at Somerset Primary and West End Primary Schools and it is due to start at the Elliot Primary school later this week. It is our goal to have the programme in 8 primary schools and to launch a middle school pilot before the end of the term. The fight against the destructive influences of the gang lifestyle cannot be confined to traditional law enforcement or simply reacting to a senseless act of violence. We are serious about prevention and the GREAT programme is a significant means by which to drive home to our young people that this community cares about them and is determined to equip them with the tools for making positive contributions to society. Great initiative but the electorate would be also interested in hearing from our new Minister of Education regarding govt’s plans for our education system. Pre-election the OBA platform included many promises for education reform……..we have heard nearly NOTHING from our representatives since. How about a follow-up story about OBA’s proposal to ditch their campaign promise to implement the Hopkin’s Report recommendation of board-run schools? Whatever happened as a result of their public collaboration on this topic? If I am correct his programme is not new idea. But lets hopefully it will get going. Once again, a statement to give the appearance of something new. G.R.E.A.T. was introduced to thousands of school students over the past 15 years when the Police delivered the program. It has had varying degrees of success and commitment from both the Police and educators – but nonetheless, a good program to introduce young students to. Been there. Done that. But good to see it being delivered by the BPS (not Gov’t) again. Read the press release with full remarks and you will see that it talks about the reintroduction of the programme. There is no attempt in any way to suggest that this is a new programme by the Govt. All boils down to perception on the part of the children et al. Social services covers this already. People are tired of ‘cops’ telling them what to do. Terry, you ever think that the Police are getting tired of doing everyones job for them. We need cops on the streets not conducting lessons. The best way to combat gang violence is to provide jobs for as many people as possible especially young black men. Right now the unemployment rate for that demographic group hovers around 40% and until that changes unfortunately anti-social behaviour will continue. I’m in no way excusing this behaviour but this is the reality Bermuda is currently dealing with and the sooner the economic issue is addressed the sooner things will improve. Today’s visit just an exercise in futility. Yes the PLP caused it but the OBA can do a lot more.